“Most people know that when sea turtles lay eggs they cry”. 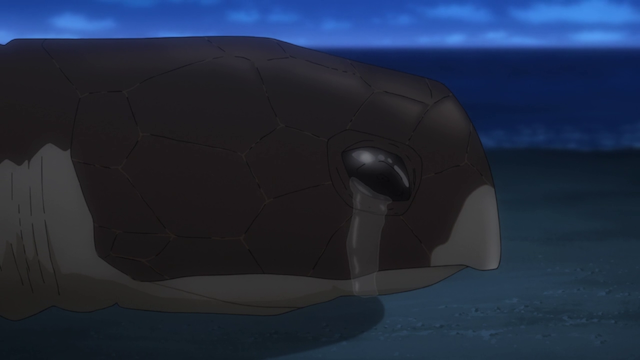 Episode 83 of Space Brothers (Uchuu Kyoudai) was enjoyable, and not just because it showed animation of sea turtles crying. I generally have a problem with any series that lasts this long. In my opinion, long series allow the story to meander and the production team succumbs to the temptation of adding pointless filler. Space Brothers is an example of this phenomenon, and I have considered dropping it more than once. The pace seems to drag, as concepts that don’t deserve entire episodes are given precisely that. Also “Mr. Hibbito”, might have been a cute idea, or a fun aside, or even useful for an episode or two, but it is really just filler and thus should stop. All that having been said, there was something quite well done in this episode. The main premise was the effects of having told Mutta and Kenji that they are competing against each other for a single position on a moon mission. Kenji becomes cold (and hates himself for it). Mutta’s inferiority complex almost leads him to give up. All the while a side character was raving about sea turtles this and sea turtles that. The more sea turtles were discussed (sea turtles cry; sea turtles can’t breathe underwater; sea turtles are graceful; the sight of a sea turtle is considered good fortune; …), the more the viewer is lead to believe that an event with a sea turtle will be pivotal in leading the astronaut candidates out of their gloom. And yet that doesn’t happen. What does happen is that a school of barracuda enter the area where Mutta and the others are constructing a mock moon base. We have been set up for a close encounter with a sea creature of some sort, but instead of a beautiful, empathic creature, it is scary and certainly dangerous. I wouldn’t say that the scene with the barracuda was everything one might want it to be, but with all of the build up, it is easy to see how it would be a transformative experience. Obviously I do like this show, even when I can see it’s faults. At 89 episodes I’ve watched more Space Bros than I have other long-running series (Bleach, Naruto, One Piece, Prince of Tennis), which I typically drop at about episode 50. I do wish the production team would do a better job at picking specific dramatic moments to develop, rather than handling EVERY hesitation, EVERY fear, EVERY question with the same approach of dragging it out so that it takes up a whole episode. This show would be much better if they trimmed the fat. There is a lot of good stuff underneath it, nevertheless. 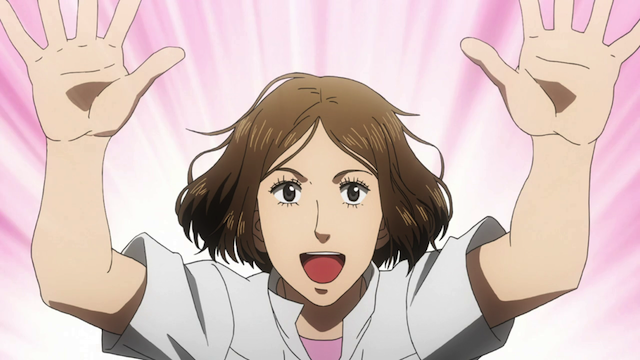 Space Bros 57 ~ have you stopped to consider the cons to that method? Building a robotic rover for the Comeback Competition. Episode 57 of Space Brothers (Uchuu Kyodai) saw the team working on their entry in the Comeback Competition. Up to now the Comeback arc has focussed mostly on the personal challenges confronting Nanba and his fellow astronaut candidates (in particular Pico, the unhelpful engineer adviser that was assigned to their team). This episode, however, provided a narrative in which the team confronted technical challenges and overcame them with engineering solutions. The result was entertaining and atypical for the anime-viewing experience. While this series has provided some very good episodes that focussed on personal challenges (the self-doubt someone can face when they make a mid-life career change, for example), I am particularly glad that we got an episode out of it that tackled this sort of objective obstacle. 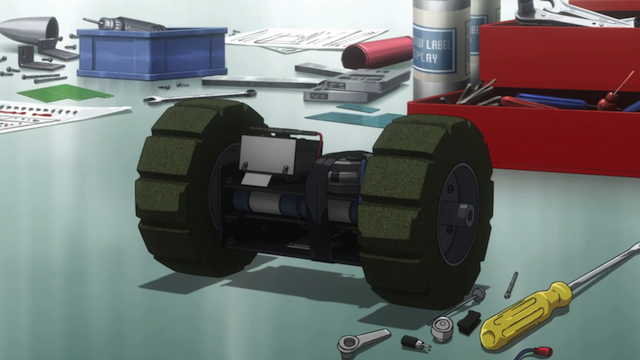 In fact I would go so far as to say that this episode was the sort of thing I was hoping to get out of Robotics;Notes, but never did. 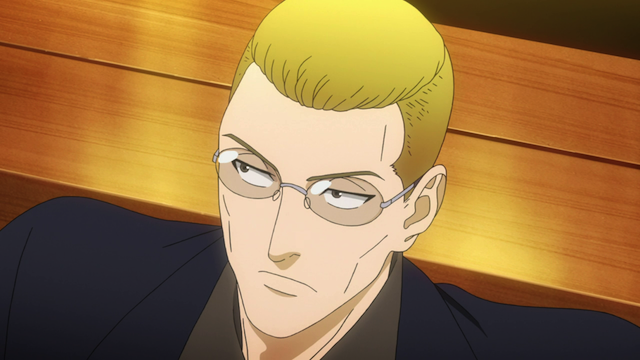 SpaceBros has proven that a robotics competition can provide a compelling narrative without resorting to secret organizations, unreal technology, mysterious powers and so forth. We should have more shows like this, in which a group of people peacefully resolve a challenge. The process by which people act as a team to solve a problem can be an interesting story, and it still offers the opportunity for characterization, humor, setting, and so forth. Another recent show that made the process by which a group of people reasoned towards a solution the substance of the narrative was Hyouka. More of this please! The finished autonomous rover; she’s a beauty! NASA chief, Jason Butler, gets serious. Even though this was a low key episode, I think episode 47 of Space Brothers (Uchuu Kyodai) did a pretty good job of setting up the conflict for the next arc. First we have an ominous reminder that even when the two year astronaut training program is over, some people quit, because they realize they don’t have “the right stuff”. Even those who become astronauts, such as Murasaki, never get a chance to head out into space. Here comes trouble: Vincent Bold. 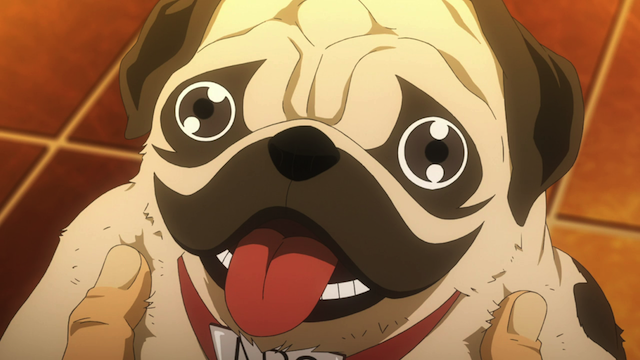 Unfortunately for Mutta Namba, his trainer has already decided that he is a lost cause. 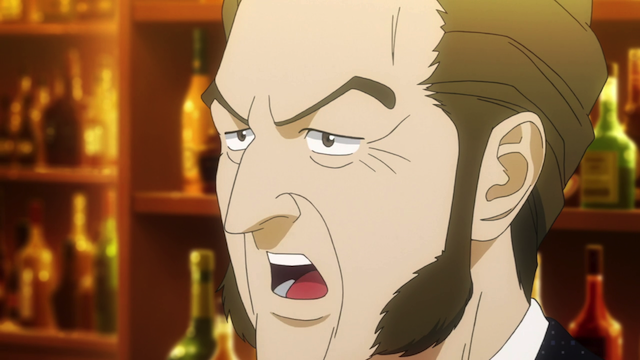 There were a lot of shots of him looking disapprovingly at Mutta, and even a fortune-telling scene in which it was suggested that something very bad lurks in Mutta’s future. Clearly the next major challenge for Mutta will be the training program, and dealing with his instructor in particular. Mutta has a tendency to doubt himself anyway, so having an instructor who thinks his job is to wash out the refuse will be a tough situation. Actually you can tell the trainer, Vincent Bold is spells trouble for Mutta just by his casting. He is voiced by Kenjiro Tsuda, who played, for example, the Red King, Mikoto Suoh, in last season’s K, and he was Chikage Kazama, the leader of the oni in Hakuouki (Hakuouki Shinsengumi Kitan). 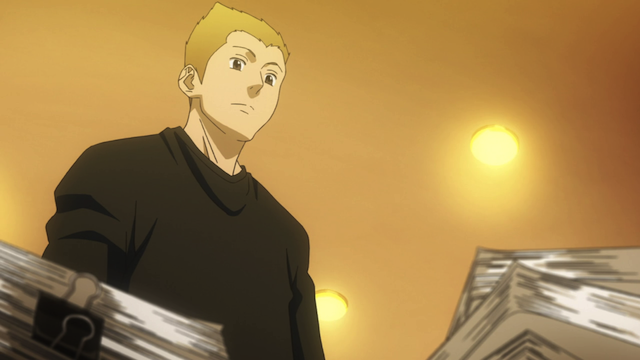 Hibito Nanba looks over a pile of NASA training manuals. 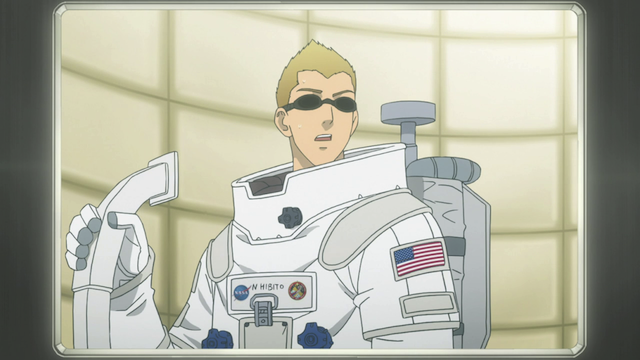 Episode 5 of Uchuu Kyoudai (Space Brothers) sees Mutta Nanba reunited with his brother Hibito in Houstan Texas, USA. Instead of going to the NASA space center, Mutta takes the first day off. A lot could be said about the interactions between the brothers, but one thing stuck with me: that stack of training manuals. I think something was being said when Hibito stared at them. My best guess is that he can tell that they have been shifted about. Further, my guess is that one reason, though he doesn’t say it, that Mutta didn’t go in to the Space Center is because he was reading the training manuals. I wonder if this will play a role later on. Mutta is a stickler for details. That was established earlier, and was stressed in this episode. 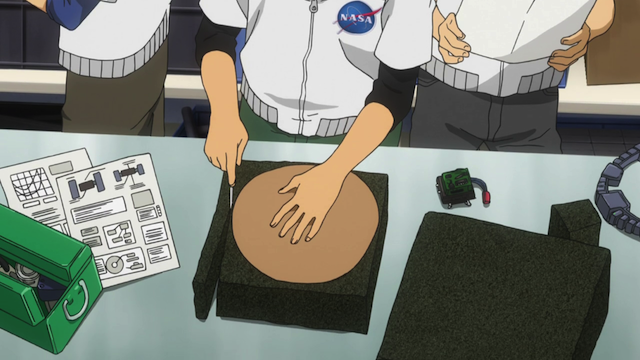 Perhaps Mutta will whip out some knowledge he received by reading the manuals during his visit to the Space Center.